The havoc wrecked by the El Niño flash floods in Peru has claimed 72 lives and destroyed more than 100,000 properties so far. The downpour is said to be 10 times more than what Peru is accustomed to. The authorities in Peru have declared the flood situation the worse in the past two decades. According to Peru’s Senamhi national weather service, the rain has increased the flow of water in the Amazon river. The river is currently flowing at 117 meters (384 feet) above sea level at the H-Enapu Peru monitoring station, which is 1.02 meters above Amazon’s normal water level. The weather service has predicted that the districts of Punchana, Belen, Iquitos and San Juan Bautista in Maynas province of the Loreto region could possibly flood in the coming days. Predictions of intense rain and thunderstorms in the coming days have also been made. Areas likely to be affected are the northern regions of Cajamarca, Tumbes, Piura, Lambayeque and La Libertad. Rains of lesser intensity are predicted in the Amazonas and Ancash regions. 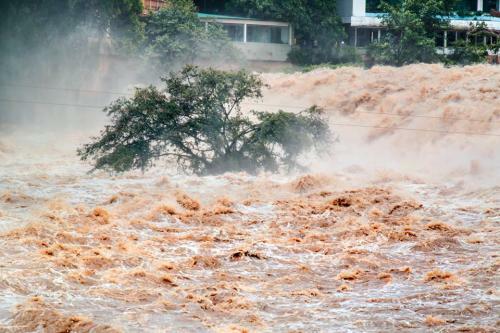 The current quantum of damage in Peru is close to a 1988 El Niño triggered flood which claimed 374 lives.